Here is part of my quilt top, 'Short Trips Around the World'. The pattern was from a tutorial by Katy Jones. I have entered it to the Sydney Quilt Show at Darling Harbour this year. 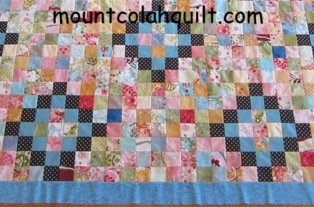 Both the quilt design and colour scheme weren't what I would normally choose. But I was curious to see how I would feel when working on this kind of scrappy quilt - 'outside my comfort zone' was one way of looking at it. The experience was fun and I really enjoyed it. The process, in principle, was very similar to project management. It's probably why I enjoyed it so much.! I'm still deciding how I would like to quilt it.... I will find out in early May whether or not it will be accepted to be juried and hung at the Show, so fingers crossed.! I love scrappy quilts and they are fun if you go with the flow. Love to see what you quilt on it. I'm curious about how it will be quilted too. :-) It must be done soon. I will keep you updated. Cheers.